ONCE THE TOUR VAN DROVE OUT OF TOWN, IT WAS APPARENT THAT THE SACRED VALLEY IS SO BEAUTIFUL IT HURTS. I was lucky again to be in a small group of 9. We didn’t talk much since it was only me and another retired couple who speaks English. But even with the lack of spoken language, the “ooh” and “aah” while we passed through the valley proved that we are equally mesmerized by the sceneries. 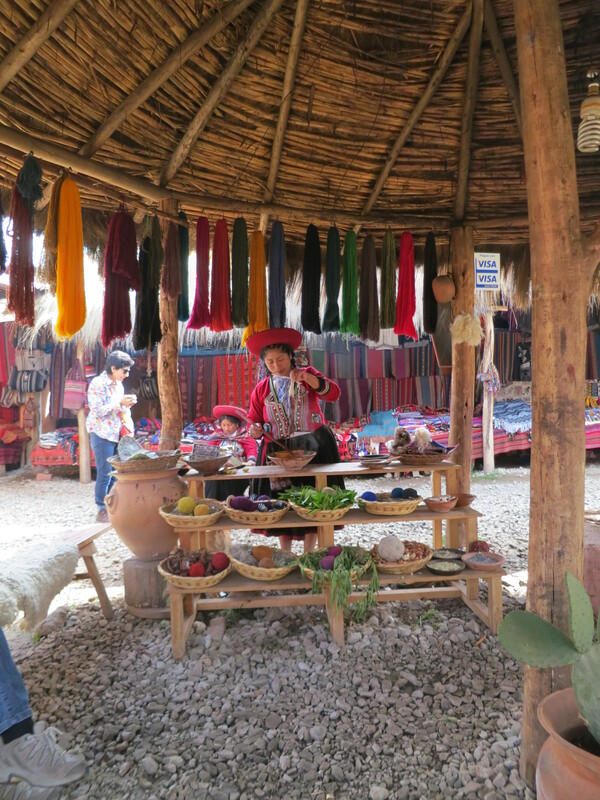 It was just a short 30 minute drive to our first stop at Chinchero. 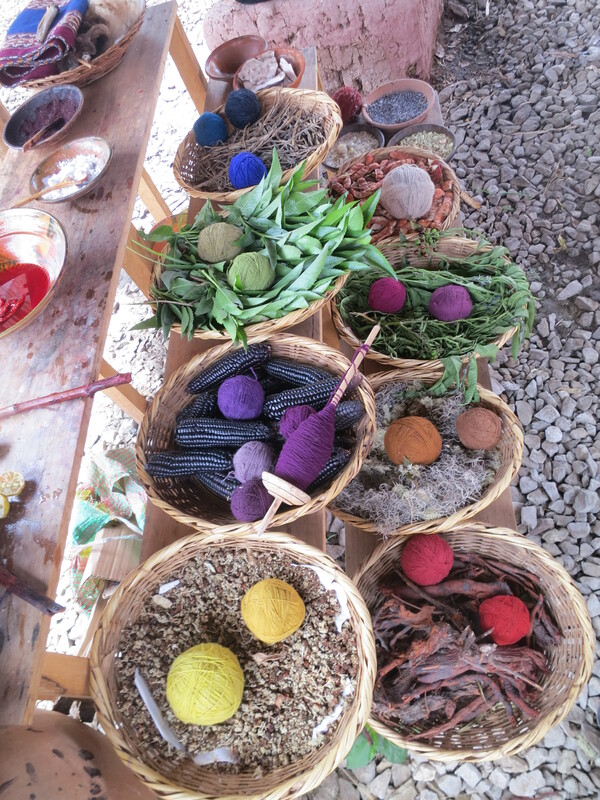 We visited a local textile production site, where demonstrations of how the Andeans dye and weave were given. 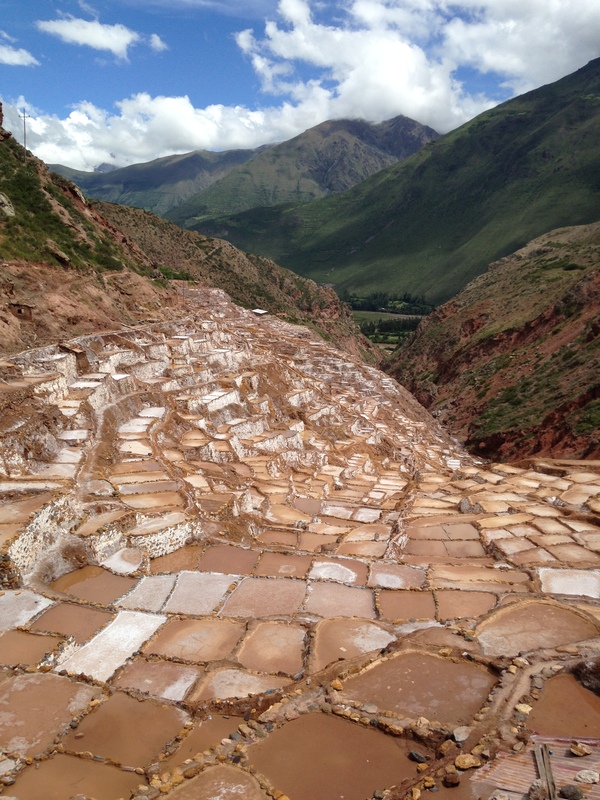 Next on was the Salineras de Maras (Salt flats of Maras). This one’s a bit disappointing because during summer, the salt flats does not work due to the rain. All we saw were muddy terraces. The guide was kind enough to show us photos of what we missed. MORAY, FOR ME, IS THE HIGHLIGHT OF THIS SHORT TOUR. 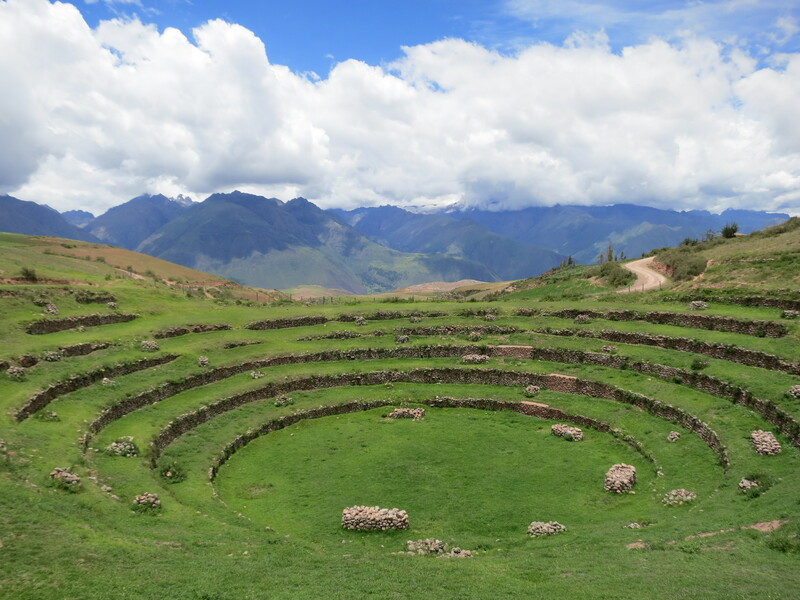 Concentric rings formed by the Incas as an experimental greenhouse several hundred of years ago, this site is so mind-blowingly big, it can only be experienced on-site. 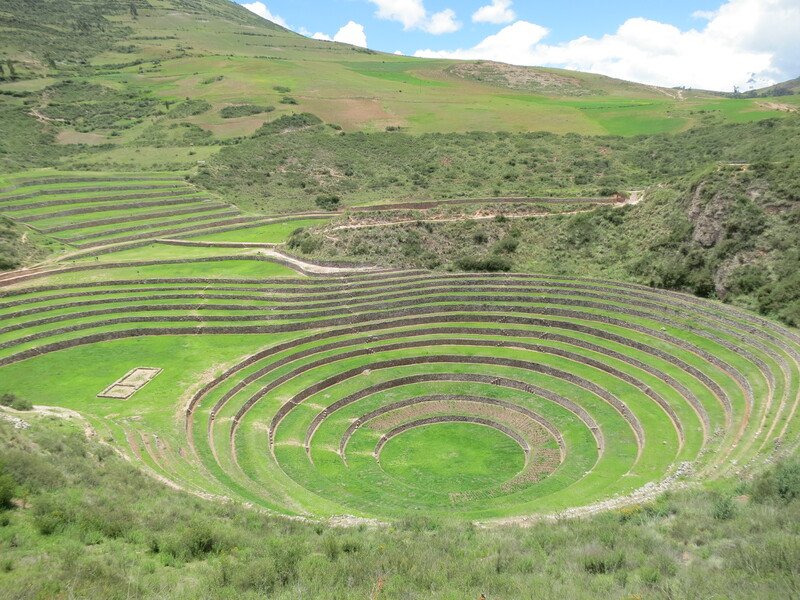 The depressions in each of the rings cause micro-climate changes that provide the Incas an opportunity to play with each crop. One is shaped like an uterus, and another like a phallus, which both symbolize fertility. Our guide gave us 30 minutes to walk, but I barely had time to encircle the sites, let alone explore them. THE MAIN REASON I TOOK A ORGANISED TOUR is because I needed a convenient way to see the sights and get to Ollantaytambo. There are collectivos that go from Cusco to Ollantaytambo but these do not allow me to visit the attractions. I can take separate minivans to each sites, but then it would cost me more time, and I had to bring my backpack along. This tour allows me to leave my bags on the van, see all attractions, and is considerably cheaper than taking a taxi. Once I saw everything on this route, I asked the driver to stop me by the highway so that I can catch a collectivo heading to Ollantaytambo. As soon as I stepped out of the van, a guy taking a leak on the side of the road started waving at me. “Urubamba, senor?” Taxi/collectivos/minivan drivers are very enthusiastic in getting potential customers. S/5 soles for a ride to Urubamba sounds cheap, so I went on his car, and then switched into a collectivo in Urubamba for S/1.50. Taking a collectivo is a very interesting experience. These are mini-vans, crammed to their capacities, loading and unloading passengers along the way to their respective destinations. I’ve seen worse transport elsewhere. The collectivos in Peru are actually quite a cheap and efficient mode of transportation (as long as you can secure a seat). IN OLLANTAYTAMBO, I AM STAYING WITH A HOME STAY FAMILY. 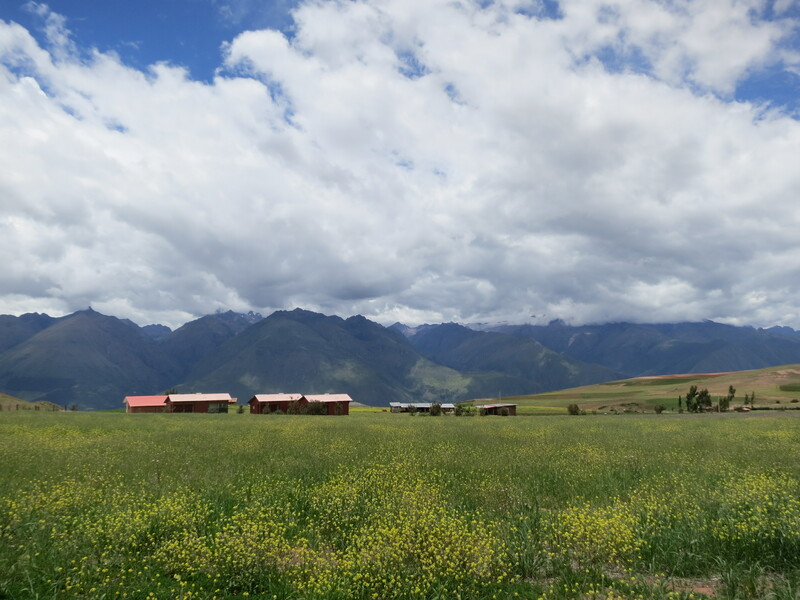 Reading through reviews, I found Awamaki, an NGO that helps support Sacred Valley local women, but also help set up home stay opportunities. I was led by one of their staff to Gregoria’s house, which I will be staying for the next 3 days. Gregoria and Mario’s house is big. If though it wasn’t big enough, they are constructing another building beside it. She has more than a dozen of rooms that she rents out to people. Her children each has their own rooms and there is one at the end of the corridor for home stay visitors like me. The room has two single beds, posters of Korean stars and One Direction, and is simple yet comfortable. They served me plentiful portions of rice, beans and steamed vegetables. With my limited Spanish, I managed to strike up conversations with both my home stay parents, the grandmother (abuela), Mario’s brother Gregorio and their youngest daughter Gimena. All is well until later that night when I found out there was no hot water in the showers. It was 10pm but the family went to bed around 8pm. Alright, I thought, this being the rural Peru, I decided to “French” it out, typing this post without Wi-Fi in my dirty underclothes.